Forward-thinking teaching to move kids one step ahead. 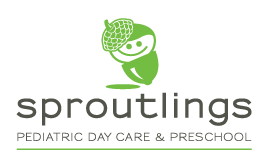 Sproutlings utilizes The Creative Curriculum®, a nationally recognized system that helps teach children to be creative, confident thinkers. By incorporating the latest research and best practices, this modern education approach is designed to be challenging and developmentally appropriate. It can also be individualized to suit each student’s learning style. Through this method, the Sproutlings staff can focus on developing skills that are critical in preparing children for school. Literacy, math and social studies are explored through play and small study groups. Cooperative play helps develop social-emotional skills, as well as normal language development. Fine and gross motor skills grow through play on the playground and work in art space. SMART Boards introduce students to technology through exciting interactive programs. Small science activities occur as students discover nature outside, grow their own plants in planters and conduct experiments in the classroom. Weekly classes introduce students to music, movement and sign language.